These supplements have been carefully selected to ensure superior quality. They are manufactured in quality controlled environments using human food grade ingredients, and have been priced to save you £££s. Please contact our Equine Office to order your supplement. 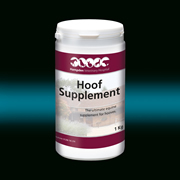 Provides all the nutrients necessary to protect and nourish every layer within the hoof horn. This sulphur enriched formula will ensure that important nutrients are supplied to the horse’s diet, to optimise hoof growth and improve integrity of the hoof. It contains a concentrated source of the sulphur rich amino acid Methionine and the sulphur rich nutrient MSM. Keratin Sulphate, the structural component of the hoof horn has a high sulphur content. It contains a very high level of Biotin 37.5mg per daily serving. Also included are Calcium, essential for cohesion in the hoof wall, Zinc which is required for healing of all epidermal tissue and other amino acids which are the building blocks of protein. Glucosamine HCL 99% pure is a non-toxic molecule which is essential in the production of cartilage, joint fluid, tendons and ligaments. A concentrated form of Glucosamine Hydrochloride – over 99% pure. Glucosamine is a naturally occurring non-toxic molecule which is essential in the production ofcartilage, joint fluid, tendons and ligaments. Joint Aid is a daily feed supplement for the nutritional maintenance of healthy cartilage and joints. An Elite Joint Supplement for Horses with Natural Pain Relief (Boswellia Serrata). As per our Joint Supplement but includes the natural pain relief ingredient Boswellia Serrata. Competition Horses – Please consult your governing body before using. A unique supplement for daily feeding to horses prone to gastric disturbances. Veterinary Gastric Supplement will assist in maintaining optimum gut health and function, allowing maximum utilisation of feed. Veterinary Gastric Supplement supplies a unique formulation of prebiotics, amino acids, seaweed extract and specific minerals necessary to aid in the recovery and maintenance of a healthy digestive tract. It is supplied in a convenient pelleted formulation. Complementary feedingstuff for horses. Supplements vitamins and other nutrients to support digestion and gastric health. Use during and after antibiotic treatment, during digestive disorders and incidence of diarrhoea, following deworming. An equine nutritional supplement to promote and maintain optimum health. No dextrose so suitable for laminitics. No iron so suitable for liver conditions. Veterinary Haemo Tonic is a palatable Iron, B-Complex and Cobalt enriched syrup on a Sorbitol base. A premium Iron Enriched B vitamin syrup. It also contains Sorbitol, which enhances the serum concentrations that result from the oral administration of Vitamin B12. Competition horses need dietary supplementation of B complex vitamins and Iron, as these nutrients are needed for red blood cell formation and important metabolic functions relating to exercise Veterinary Haemo Formula will supply these nutrients to fortify and strengthen performance horses, which will ensure that their full athletic potential is expressed in competition. Prices subject to change. Supplements are VAT exempt except where indicated. Durations approx and may vary depending on size of horse/pony. Items can be collected from either our Farm/Equine Office in Central Aylesbury or our Equine Clinic at Whitchurch. Items can also be posted to you, although this would incur an addition cost.